Renting out a home is not as simple a task as one might think it to be. There are a number of decisions that a landlord has to make before he chooses a tenant for his rental property. One of these decisions is regarding single or multi-tenancy. You have to determine whether having a single tenant is better for you or a bunch of them. However, before deciding on this crucial aspect, you must consider the following factors. For landlords who are busy with their work, having a single tenant is the best option. There is hardly any responsibility on your part. When the tenant gives you the check, you just have to deposit it in your bank and that’s it. Nowadays, internet banking can also be used by the tenant to pay the rent, making it even easier for you. A multi- tenant rental property will have you involved at every step of decision making even if you have hired a local property manager. This will make things really hectic for you. Thus, for busy landlords, a multi-tenant system is definitely not a good option. 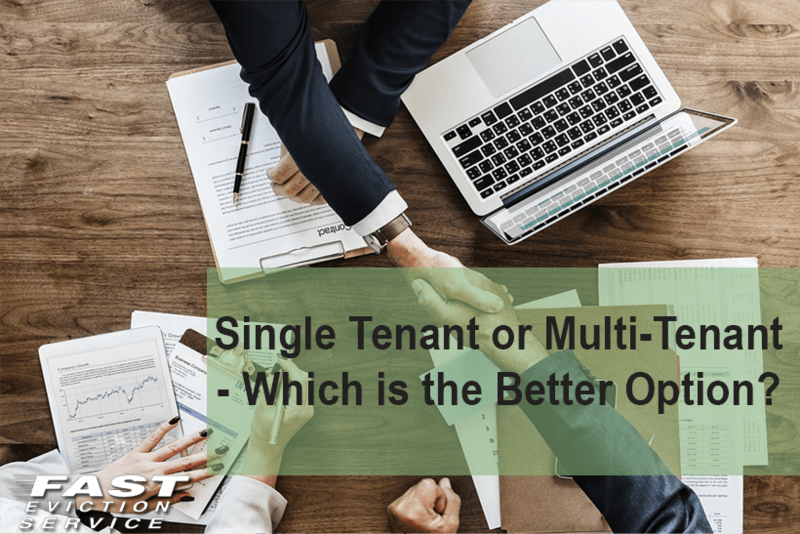 The risk of loss of total rent for a single tenant rental property is relatively high when compared to multi-tenant rental properties. In a single tenant system, if the tenant does not renew the lease, the landlord will lose his source of income. But in the multi-tenant system, it will only cause the landlord a partial loss if one of the tenants does not renew his lease. The lease for a single tenant rental property is usually for a very long duration and that too with flat rate rent which in due course of time is a deal of loss for the landlord. On the other hand, the lease for a multi-tenant rental property is only for a period of 5 years or less and allows for the increase in rent of about 1-3% on an annual basis that can go up to 5% if your property is in a very desirable location. In a single tenant rental property, if the tenant decides to move out it may take a lot of time to find a new tenant. Whereas in a multi-tenant rental property, when one of the tenants leave, they may recommend someone they know. In many cases this makes it easier for the landlord to find a new tenant.